Vera Anstey retired in 1964 and following her death in 1976 the Vera Anstey Suite in the Old Building was named in Vera’s honour and a pencil drawing of her was hung in the lobby. The drawing was removed at some point but in 2017 it was re-hung in the entrance lobby. The drawing is a mystery as there is no information on either the artist or the commission. When the drawing was re-framed in 2017 no further details came to light. 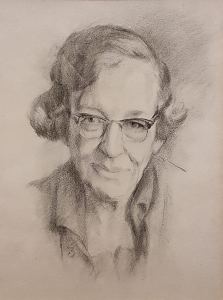 The School commissioned portraits of some staff on retirement, such as Arthur Bowley so the drawing may have been commissioned for Vera Anstey’s retirement. While we know very little about the drawing, Vera Anstey was a significant presence at the School before and after the Second World War. Vera Powell was born in Reigate and attended Cheltenham Ladies College from 1902-1905 and studied music and German at the Hoch Conservatorium Frankfurt until 1909. Returning to London she completed a diploma in public health at Bedford College before studying for the BSc (Econ) specialising in Economic History at LSE “with the intention of becoming a factory inspector”. Vera combined her studies with a keen interest in sport – she was a founder member of the LSE hockey club and held a Gerstenberg Scholarship in economics. She also met her husband Percy Louise Anstey who had graduated in 1910 and had been President of the Students’ Union. They married in 1913. Vera was awarded a first class degree but it was Percy Anstey, with a second class honours degree, who was appointed as head of the Economics Department at Bristol University and then Principal of Sydenham College of Commerce and Economics in Bombay. Vera joined Percy in Bombay where their three children were born and she worked as an examiner in economic theory for the B Commerce degree. It was also the foundation of her lifelong interest in the Indian economy. In 1920 Percy and their youngest child, Arthur, died of cholera and Vera returned to England, with two children, in desperate need of a job. She was not original & not brilliant but so absolutely sane, clear, quick, intelligent and safe… She was very good at games and very good in the social life of the School. What she saw in that fool Anstey I never could make out! She could buy and sell him & live by the profit in two seconds. Someone who came back – I can’t remember the name – told me that she was running the whole economic department there in Bombay which I quite believe. Vera Anstey was appointed assistant lecturer in economic history in 1921, teaching a class in descriptive economics and English for overseas students and students needing help with essay writing. She joined the regular staff in 1922 earning £300 pa and took over teaching on Indian trade and production in 1923. 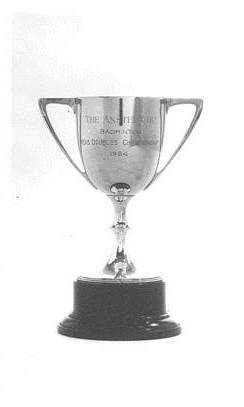 Beveridge may also have been looking for a badminton doubles partner as it appears that Anstey and Beveridge were a successful mixed doubles partnership. Mrs Anstey’s diligence and appetite for facts is tremendous. She overwhelms me with typescript, interleaved with copious additions in manuscript… Her first draft will require a great deal of careful condensation and tightening up to make a good thesis; and that thesis when complete will require a repetition of the same process if it is to make a useful text book – which I take is the ultimate aim. Howbeit she has resolution enough to carry this through. The DSc was awarded in 1930 after the publication of The Trade of the Indian Ocean and The Economic Development of India in 1929. Vera began graduate teaching in 1932 with two courses and a seminar on the problems of Indian economic development. She became Sir Ernest Cassel Lecturer in Commerce in 1933. While it may be that her claim to promotion rests more on her success as a teacher than on great scholarly achievements, it seems to me that the former are of sufficient weight to justify the promotion. On 1 October 1941 she became Sir Ernest Cassell Reader in Commerce with a salary of £600. She finally obtained a major readership in 1948 but never became a professor. After the war Vera Anstey continued her work as a teacher and on the Admissions Committee. From 1950-1955 she served on the Royal Commission on the Taxation of Profits and Income. Vera Anstey retired in 1954 but continued as a part time member of staff until 1964 when her text book Introduction to Economics for Students in India and Pakistan was published. The School has lost a great former teacher, a distinguished honorary fellow and a person who has contributed much to holding it together. I am writing on world war one as experienced in India and from India and the Anstey’s were in Bombay 1914-1920, the city through which men and materials poured out for Mesopotamia and East Africa etc.